As the illegal wildcat statewide strike of teachers in 55 counties in West Virginia stretches into its 4th day, West Virginia Governor and billionaire coal baron Jim Justice has found himself on the defensive. In order to resolve the dispute, Justice will likely have to take on members of his own party, who are resisting calls to increase taxes on the natural gas industry. However, in Wheeling Monday night, Justice found himself on the defensive and facing boos from the crowd as he urged the union to the end the strike. “You need to be back in the classroom. Kids need to be back in the classroom. Doing more than the pay raise as it is right now, and you’re not going to like this. It would not be a wise move. It would be a dumb move,” Justice told the crowd in a televised town hall in Wheeling, West Virginia. Justice was repeatedly booed by the crowd when he would not push the current session of the state legislature to pass anything more than the 1% raise approved by the legislature earlier this session. Teachers have claimed that the Public Employee Insurance Agency’s exploding premiums and deductibles would eat away at the 1% raise that they were offered. As a result of the exploding health care costs, West Virginia was one of only five states that saw a net decrease in teacher’s take-home pay. Currently, teachers in West Virginia earn the 48th lowest average salaries in the nation. The Governor instead pledged to appoint a task force to come up with recommendations on how to use the natural gas revenue to fund improvements to PEIA, the state’s health insurance program. Justice has repeatedly told them that no funds from the state’s general revenues can be spent to help fix exploding health care premiums for teachers. The recent Democrat-turned-Republican Justice criticized a GOP “co-tenancy bill” that passed the House. The bill is called a “co-tenancy bill” because it changes lease terms on drilling. Under current West Virginia law, a drilling company needs the agreement of 100% of the landowners to drill. However, under a “co-tenancy” bill that passed the House of Delegates earlier this year, leasing companies would only need the permission of 75% of landowners to pass a bill. Justice has pledged to veto the “co-tenancy” bill in its current form. However, natural gas companies remain opposed to the Justice proposal — a “joint development bill” that would keep current leasing laws intact and raise taxes on frackers. “The concept of a broad, omnibus natural gas bill including joint development and increases in severance taxes has been discussed for several months, and it has been very clear to me that such legislation does not have the support needed to pass the Legislature,” Republican House Speaker Terry Armstead said in a statement. “Many legislators, as well as landowners, farmers, land rights groups and royalty owner groups oppose joint development and believe it would be harmful to landowners in our state. This fact has been shared repeatedly with the Governor,” said Armstead. However, teachers have called for a repeal of corporate taxes and the use of those funds to create a permanent source of revenue to fix PEIA. Proposals that Justice has so far rejected instead call for a special session in May where legislators will be urged to vote to raise taxes on natural gas. So far, the teachers have been able to rally massive public support behind their illegal wildcat strike. On Tuesday, United Mine Workers President Cecil Roberts, a backwoods Baptist preacher, gave a roaring speech, calling on West Virginians to remember their history of struggle. He called on the striking teachers to engage in civil disobedience as their ancestors had during the 1921 struggle of striking mine workers at the Battle of Blair Mountain and the 1969 strike of 40,000 coal miners, who occupied the West Virginia State Capitol. “When those miners came here [in 1969], they were breaking the law [and] when those miners marched on Blair Mountain, they were breaking the law,” Roberts told the assembled crowd during a half-hour labor sermon. 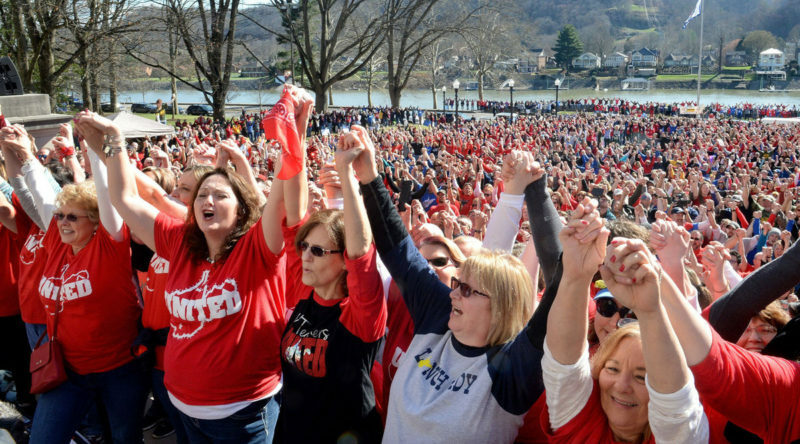 Despite breaking the law, the teachers have rallied near unanimous support. 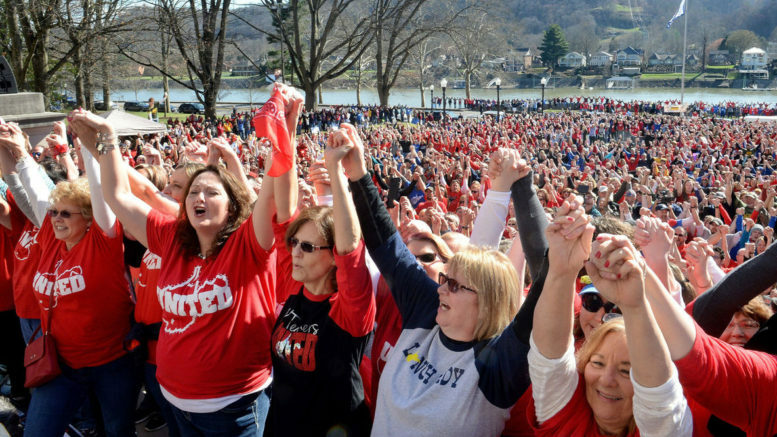 The West Virginia PTA voiced their support for the strikers as well. It’s clear that the protests are already having an effect on Governor Jim Justice’s desire to take on the union. Governor Jim Justice told an audience in Morgantown that he would veto any attempt of the state legislature to fund charter schools and create alternative teacher certification programs. He also said he would veto any effort of Republicans in the legislature to outlaw the use of paycheck deduction to fund the political organizing of teachers’ unions. WIth support for the teachers remaining high among the public, teachers plan to stay on strike indefinitely. However, on Tuesday, the State Board of Education is expected to convene and could order an injunction. West Virginia State Attorney General Patrick Morrissey has said that he is prepared to assist any local school boards in taking action to return the teachers to their classrooms. AFT President Randi Weingarten told Payday Report in an exclusive interview that her union would fight any such injunction. State labor leaders have vowed to engage in civil disobedience against any such orders. While the strike continues, the teachers’ union has run food drives for the many children who only received their daily meals through subsidized school programs. 1 Comment on "Settling West Virginia Teachers Strike Could Hinge on Taxing Frackers"
Good strike coverage! Thanks for your effort.